The object of the race was to discover the value of the bronco both to horse-breeders and to government officials of the cavalry branch of the army service. To this end the race was thrown open to any horse in the world. Several animals of good blood, notably some crossed with Hambletonian and Morgan strains, were entered, but not one of them came in among the first six who shared the prize money. Before starting, each horse was thoroughly examined by veterinaries, and a record kept of its weight, age, description, and measurements. This was to furnish later data for comparison. The horses ranged in weight from about 850 pounds to about 1,075. The total weight carried by them was about 185 pounds, including rider, saddle and all equipment. All along the route were established checking stations, where the riders registered upon arrival, and the horses were examined by veterinaries and their condition passed upon before the animals were allowed to continue. Any horse found unfit to travel farther with safety was ruled out of the race. As most of the horses were ridden by their owners, the greatest care was taken of them. 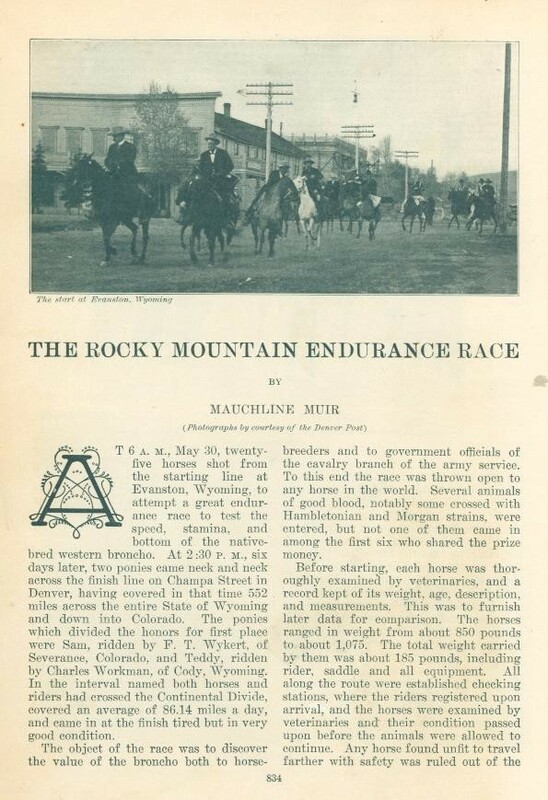 The result was that the animals which stood the travel arrived to Denver in good condition, which was quite contrary to the last great endurance race, the one run from Vienna to Berlin some fifteen years ago. Though the European race was over two hundred miles less ground the two winning horses were practically killed, one falling exhausted at the finish and the other dying next day in the stable. The course of the race was along the old Overland Trail, now followed by the Union Pacific Railroad. Evanston is in the southwestern corner of Wyoming, and from that point the trail swept in a long segment of a circle to Cheyenne, in the southeast corner, and thence south to Denver. Everywhere along the route the greatest interest was taken in the race. 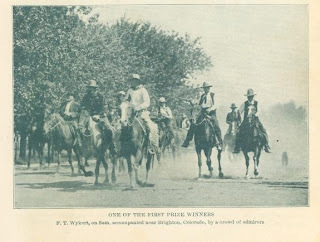 The news of the approach of the riders was flashed by wire, and all the ranches and little cow towns furnished an enthusiastic contingent to cheer the contestants on their way. 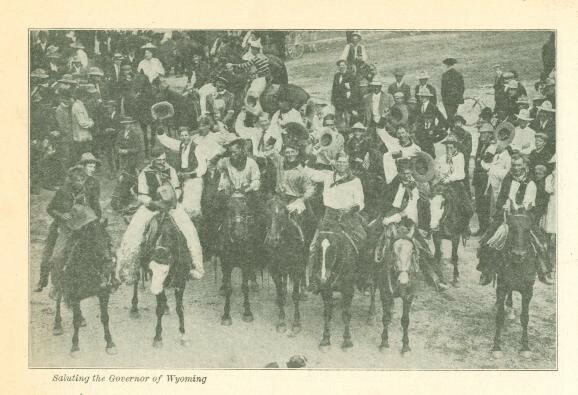 Laramie, Rawlins, Cheyenne, turned out their entire populations, and at least thirty thousand people lined up and waited patiently many hours for the finish. 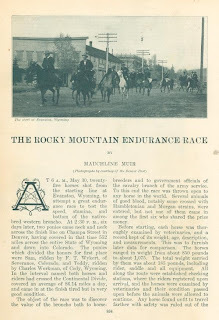 Every section of the Rockies from which there came a horse and rider had its local patriotism and wired to the "favorite son" offers of additional prizes if he should capture first place. The horse teddy, known by the cowboys as "that Cody hawss," took the lead from the start and opened a wide gap between it and the rest of the racers. For the first day to other horses hung to its heels, one of them, a little thoroughbred stallion named Archie, ridden by Trew, beating the Cody horse into Green River that night after covering 112 miles in about sixteen hours. The second day's travel took them through Point of Rocks, and from there across the heavy sand of Red Desert. It was heavy traveling, and though the little thoroughbred stuck gamely to his work, the great strides of the big bronco, pounding steadily forward hour after hour, proved too much for the stamina of the other. Archie fell back beaten and Teddy trotted into Wamsutter alone that night, having covered 192 miles in two days with no apparent distress. The rest of the riders that remained in the race were from twenty to fifty miles behind Workman. The leader reached Rawlins shortly after noon on the third day. He rested here for several hours, and before he had left, Kern of Colorado came in on Dex. He was followed at intervals by Edwards, a Wyoming rider, and Means and McClelland, both of Colorado, the former riding a splendid blooded horse named Jay Bird. Workman passed the night at Ft. Steele, eighteen miles in front of the others. He had covered only sixty-nine miles the third day. From this time the best of the others began to close in on Teddy. He reached Medicine Bow (Owen Wister's town, made famous by "The Virginian"), nearly two hours before Kern, who was followed by Means and Edwards. Next morning, four leaders, instead of one, started out to set the pace from Medicine Bow, on the last half of the Journey. The last of the riders left Rawlins at the same time, a good day's journey behind. Some of the rearguard were already gaining fast on the leaders, notably Casto and Wykert. The latter especially was riding very strong. At one time sixty miles behind Workman, by long night rides and steady going, his Sam came into Laramie late the same night that Workman, Means, Edwards, and Kerns arrived. Cheyenne was reached late the same afternoon, Wykert arriving first, followed by Workman, Edwards, Means and Kern in the order named. There was no sleep that night for the leaders. Denver was only a hundred miles away and workman was away on the long trail as soon as he and his horse had finished eating. The others were roused from sleep in the stalls with their ponies to hear the news and at once threw on their saddles and were away in pursuit. They caught him some miles out of Cheyenne, and a fast pace was set that weeded out, first, Kern on Dex, then Edwards on Sorrel Clipper, and lastly means on his Jay Bird. At Greeley, Teddy and Sam were going alone. At Fort Lupton they were still together; at Brighton there was not a rod to choose between them. Wykert's Sam was in much the better condition, but Teddy hung on and would not fall back. The conditions remained the same till they reached the outskirts of Denver. It was plain that neither could win from the other without such a grueling finish as might kill one or the other of the tired horses. It was therefore agreed to divide between Workman and Wykert first and second prizes. The horses, escorted by hundreds of riders and automobiles, rode through the great crowd and across the line side by side. The condition prize of $300 was awarded by a unanimous decision of the judges to Wykert's Sam. Edwards on Sorrel Clipper took third prize, Kern on Dex fourth, Casto on Blue Bell fifth, and David Lee, riding Cannonball, sixth. All of the ponies were broncos, or had a large strain of bronco blood in them. They had covered 552 miles in less than a week, and came in still strong and fit. The finish of this extraordinary race seems to justify the contention that for a combination of toughness, speed and stamina the native western pony can hold its own against any horse in the world. Originally published in The World To-Day Magazine, August 1908.